For those who immerse themselves in watching videos, either from internet, digital cameras or shared from friends, would notice that AVI files on Mac can be as common as potluck. However, it's also disappointed that this file format is not almighty with regard to putting AVI to mobile phones like HTC or Blackberry for convenient playback. In this case, converting avi to 3GP sounds necessary. 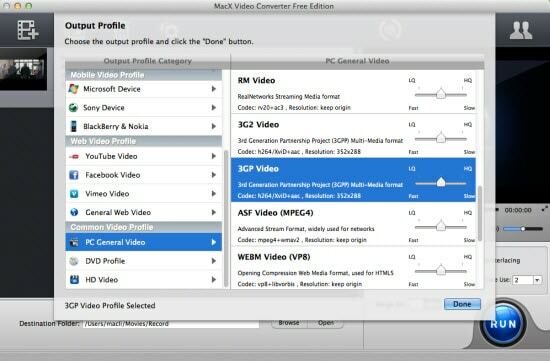 Free AVI Media Converter on Mac for Mobiles! 100% safe & free video transcoder for macOS - MacX Video Converter Free - decode AVI to 3GP, MKV, FLV, WMV, 200 more files for Android, Windows, Google and Apple mobiles to watch on the go! Why do you need to change video format from AVI to 3GP on Mac? 3GP is a simplified version of the MPEG-4 Part 14 (MP4) container format, designed to decrease storage and bandwidth requirements in order to accommodate mobile phones. Compared with AVI, 3GP comes with smaller size, and is an idea format for quickly online streaming and also a widely-supported video format for most mobiles. AVI is also a popular format, but it is not so widely accepted by mobile devices and sometimes it's very large in size. If you got Nokia, Motorola, HTC, etc and want to transfer AVI videos to your mobile phone on your Mac for playback, it's necessary to convert AVI to 3GP on Mac. So which is the best free video processing software for Mac that can put those AVI files to mobiles with the best quality and fast speed? Everything is in order except what is crucial. So once you set 3GP as your final format, all you need is a professional program to put AVI to 3GP format on Mac computer. So many programs mushrooming in the market surely make you dizzy. However, some programs does not include 3GP as an output format. For example, Handbrake and VLC. Which can you rely on? * It has a slew of advanced editing settings to resize AVI files and make other large-sized video to smaller suitable for mobiles. Free download this free video to 3GP converter on Mac and run it, click "Add File" button and locate the AVI files which you want to convert or simply click "YouTube" button, then copy and paste the URL of the AVI video in the box. Click "to Mobile" button and choose the mobile phone you'd like to watch avi videos on (for example, you can select avi to iPhone). Once choosing the mobile phone like to Android, to Blackberry, to Nokia, to ZEN, etc, you can click the output format "3GP" below. You can also change audio and video parameters as you wish. After finish the above steps, click the "RUN" button to order this Mac AVI converter to start processing AVI video to 3GP conversion on macOS, you could view the conversion progress or cancel the process at anytime. For those who would like to free download YouTube AVI to iPhone X, iPad Pro, iPad mini 4, Apple TV 4, Galaxy Note 8, Sony Xperia Z5, Surface Pro 4, etc., the advanced version called MacX Video Converter Pro is the second-to-none choice for you to achieve this goal. Best-ever AVI video to 3GP converter to decode AVI videos to 3GP for playback on media player or mobile device with 5X faster speed & no quality loss. How to decode and encode AVI videos to MP4 on mac.